1) ‘Epistemic Objects: Four Channels‘ (9:32) is a four-channel looping video installation showing historical examples of embodied research captured in black & white video. I have been showing these four videos together since 2012. What is amazing here is that each of the areas of technique documented here is still being taught today: Postural Yoga, Aikido, Dance/Movement Therapy, and to a lesser extent Grotowskian actor training, are taught and accredited in many countries around the world. This shows how embodied research produces new knowledge, in the form of technique, which may be shared and transmitted across time and space. I believe these kinds of historical precedents offer a crucial context for contemporary embodied research. 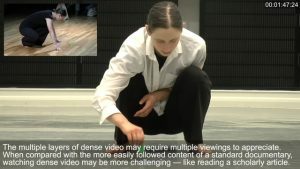 In the montage video, I read a text in which Karin Knorr Cetina describes the process of scientific laboratory research. The text resonates powerfully with these important examples of twentieth-century embodied research. 2) The short ‘Practice Ball‘ video (2:35) from Fighting Monkey is an eye-catching example of contemporary embodied research in physical culture at the border of martial arts and dance. For scholarly purposes, the quick editing of the video feels a bit too flashy for my taste. However, the video is extremely effective in getting across the energy and excitement that embodied research can have. If you look closely at the editing, you can see that there are many different techniques being demonstrated here: The practice balls is moving at different levels and being used in different ways. 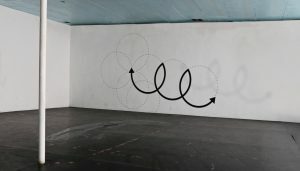 The montage of these distinct techniques, and the addition of a musical soundtrack, make the video exciting and cinematic. I think this is a great way to get people thinking about how embodied research continues in the present day. 3) The video ‘Graphic models developed by João Fiadeiro‘ (6:57) from the Blackbox Arts & Cognition project goes to the opposite extreme. Instead of fast edits showing dynamic moving bodies, it dwells on elegant computer graphics to illustrate the inner workings of Fiadeiro’s dance works. I find this video fascinating and a great complement to the previous one because no actual bodies appear in it. Instead, the abstraction of the video points to some of the sophisticated ways in which contemporary choreographic research has gone beyond the direct structuring of movement. This video challenges us to think about new ways of representing embodied technique. 4) Both approaches are combined in ‘An Introduction to the Motion Bank project’ (6:00) and ‘An impression of the key results of the Motion Bank project’ (8:30), two videos trailers introducing Motion Bank. Motion Bank was a major research project that brought together choreographers and digital artists to analyze the complex layers of choreography in works by William Forsythe, Deborah Hay, and others. Individual practitioner-researchers usually do not have the kind of resources needed to produce such a complex web-based platform. 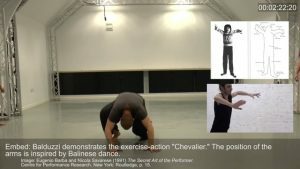 Nevertheless, the Motion Bank project is an important landmark for digital dance and for video epistemology more generally. 5) The first dense video I edited documents a session of the IFTR Performance as Research Working Group at Warwick in 2014 (10:18). In this video, a small amount of text is used to describe and explicate this exploratory session led by Bruce Barton, Tero Nauha, and myself. Here I started to experiment with different ways of introducing explanatory text into video. I also tried to capture something of the way the two-hour session developed within the span of ten minutes. There are countless working groups, performance companies, and teachers who have archives of video material that could be edited into dense videos like this. 6) One year later I produced a much denser video documenting a training session based on a ‘Sequence of Four Exercise-Actions‘ (4:19) developed by Massimiliano Balduzzi. 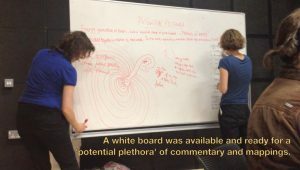 This video juxtaposes textual commentary and textual citations alongside embedded photos and videos, in order to unpack the density of the documented practice. In the screenshot you can see how the main video, which shows me demonstrating physical training, is juxtaposed with a video of Massimiliano and with a photograph of a young Balinese dancer. The subtitles explain this juxtaposition and provide the citation for the photograph. I enjoyed packing all of this information into a four-minute video and hope to see more examples like this. 7) The next step was to create a longer dense video focused on my current research, which I called ‘Judaica: Designing a Laboratory for Embodied Research’ (21:12). This video continues to experiment with audiovisual density using textual overlays and video juxtapositions. 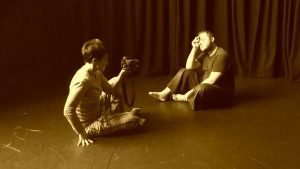 It focuses on the studio work undertaken in summer 2015 with Sióbhán Harrison and Jennifer Parkin, which led to a theatrical performance that used Ansky’s The Dybbuk as an indirect (secret) narrative into which a number of songs-actions were woven. I was never entirely pleased with the construction of this video: The video picture quality is not very good and I find the scholarly tone of the textual annotations too dry. However this was an important step for me in imagining a video research document. 8) After creating that densely edited video essay, I stepped back from montage and began to place short video excerpts alongside each other in what became the Songwork Catalogue. Each video in the Songwork Catalogue has basic metadata and some have additional commentaries. Because it is a webpage rather than a single dense video essay, the Songwork Catalogue suggests a more horizontal (or poststructuralist, in theoretical terms) approach to knowledge. It does not make a particular argument but rather offers ‘a thousand plateaus’ (Deleuze & Guattari) of glimpsed moments, each given a kind of coherency by its title. Instead of choosing a concept to illustrate and then making a video, each title was chosen after the video excerpt was selected. 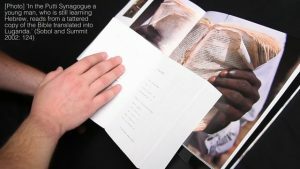 9) The most recent creation from the Judaica lab is ‘He Almost Forgets That There is a Maker of the World‘ (30:00), a video essay co-authored by Nazlihan Eda Ercin, Caroline Gatt, Agnieszka Mendel, and Ben Spatz; and edited by Ben Spatz. In this ‘illuminated’ video essay we observe thirty minutes of uncut practice in which song, action, text and image are woven seamlessly together. There is no predetermined script or choreography. Rather, the quality of flow that permeates the video arises from the accumulated bodies of knowledge of the four contributors. The density of this moment of practice is then further articulated by a series of textual citations and annotations which frame and contextualize the embodied research processes at work. 10) For a quick but dense introduction to the way my understanding of video epistemology changed during the course of the 2017 Judaica laboratory work, watch the one-minute video ‘laboratory‘. 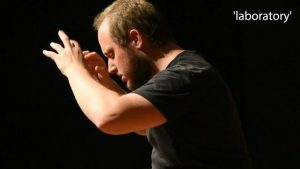 Below the video I have listed seven specific points at which this video diverges in form and content from another video recorded in late 2016 which also documents a short moment of my solo practice. The comparison between the two shows the change in approach. 11) Finally, for a somewhat dense philosophical treatment of video epistemology through an engagement with the work of Giorgio Agamben, please see my essay on ‘The Video Way of Thinking‘. Here I argue that we need to rethink the relationship between what Agamben calls zoê and bios in light of the recent and current rise of the audiovisual, which in a broad historical and philosophical sense I call technos. I hope these resources are useful. Additional links can be found at the bottom of the submission guidelines page for the Journal of Embodied Research. Please get in touch with me if you have examples of videos that articulate embodied knowledge in innovative ways, or if you would like to work with me on developing such a video.